adidas Mexicana, made in West Germany, utilising the silhouette of the established Gazelle, which was by now, accepted as THE functional sports shoe but was being seen more and more on the streets of fashionable young Europeans, rather than in the sports centres for which they were intended. The Mexicana, in this guise, shown with the matching suede tongue and boxed logo, was probably named this way by the marketing department as a homage to the 1970 world cup, of which Mexico were the host nation. Using the much favoured pigskin suede, the vibrancy of the yellow is offset with the black stripes and heel tab. 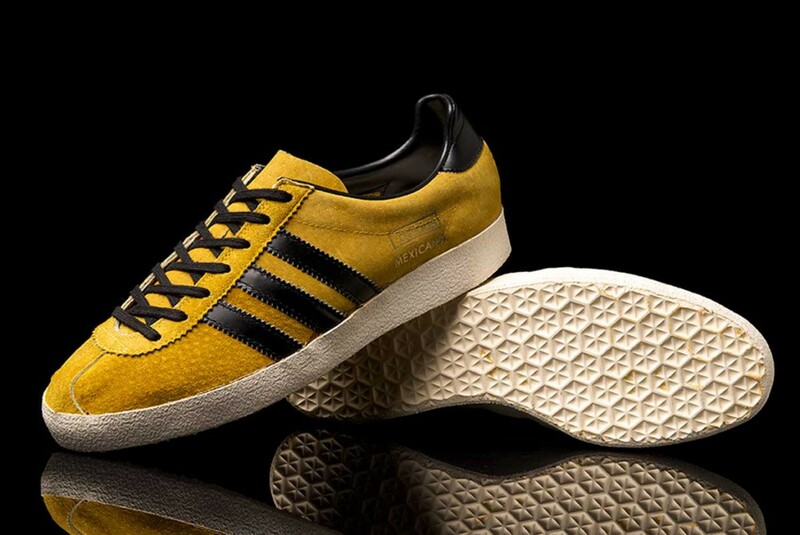 Again, re using the same white sole unit as the Gazelle rather than opting for a black or gum sole. On later variations of the model, a contrasting black vinyl tongue was used, with the trefoil logo, which was probably down to unit costs rather than aesthetics, and the boxed horizontal lettering substituted for the vertical parallel style. As yet, Mexicana hasn’t been released as a reissue, retaining its rarity and appeal to collectors, although, a recent version of the Gazelle OG was released in a close version of the Mexicana, sadly without the white sole unit.